You’re playing a tournament, seated in dealer position. UTG+2, who is a frequent raiser raised 4,000 pre-flop, and you were the only caller with K♠Q♠. Blinds are 1,000/2,000 and you both have 20,000 in chips left. Flop comes 3♠6♦10♠. 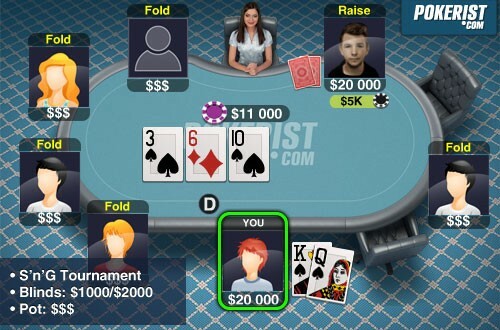 You’re opponent makes a small raise of 5,000 in the 11,000 pot.